The next morning, we headed to the East Glacier to see the other side of the park. We traveled east on Highway 2 to Browning before taking Highway 89 north. We passed Lower Saint Mary Lake to Babb, where we took Route 3 west past Lake Sherburne. Not long afterwards, we arrived Many Glacier, one of the hearts of the park. We saw several mammoth peaks – such as Mount Wilbur, Mount Henkel, Mount Grinnell and Allen Mountain – towering above us. We saw several glistening lakes and a few small glaciers. Some geologists believe these could be gone by 2020. After leaving Many Glacier, we say goodbye to Glacier National Park and took Highway 89 north. Then we took the Chief Mountain Highway (Highway 17) northwest towards Canada and Glacier’s sister park, Waterton Lakes National Park. 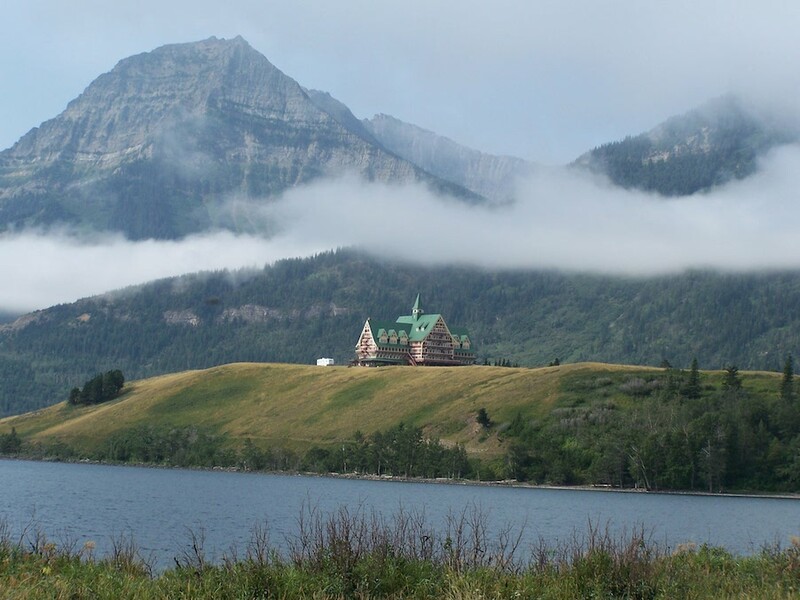 Combined, the two parks make up Glacier-Waterton International Peace Park. It is the largest cross-border national park in the world. 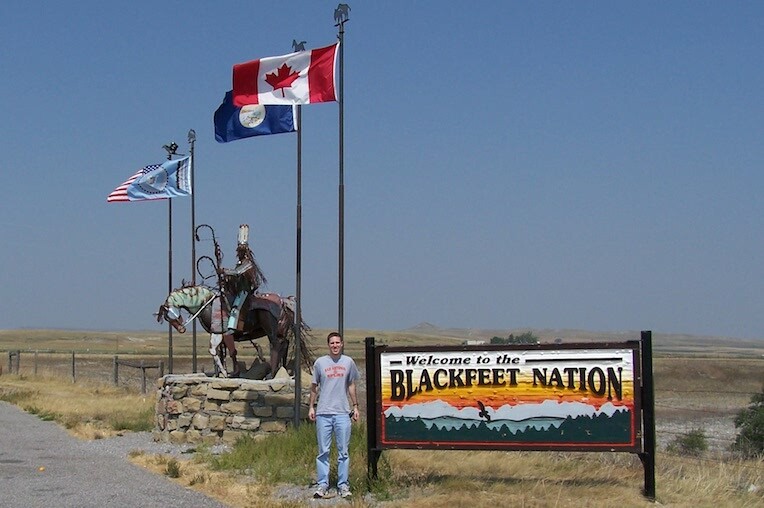 First we passed through land belonging to the Blackfeet Nation. After going through Canadian Customs, we had to stop for a photo at the Alberta sign along Highway 6. 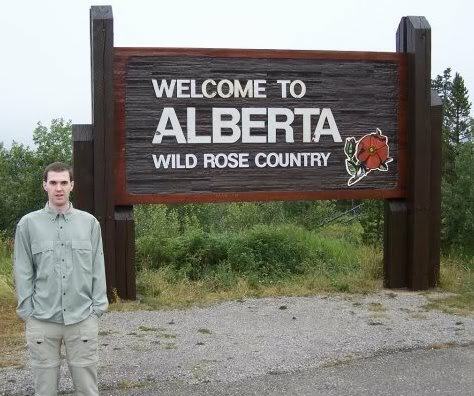 Both of us had never been to this province, which is known as Wild Rose Country. It is also known for it’s beautiful Rocky Mountain scenery and skiing. 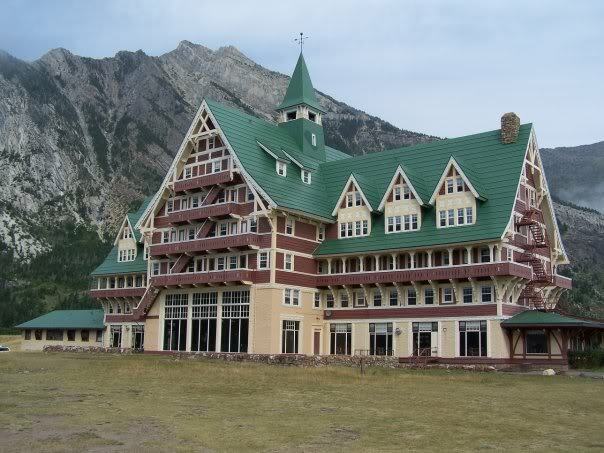 Later we drove south on Highway 5 to the Prince of Wales Hotel, which rested on a hill dramatically overlooking Upper Waterton Lake. The hotel is one of the iconic old lodges of the West built in the early 1900s to lure rail passengers on the Canadian Pacific line. Ironically, it was build by the Great Northern Railway to attract American tourists across the border during Prohibition. It was named after the Prince of Wales, who would later become King Edward VIII, to attract him to stay there during his 1927 tour of Canada. In another irony he did not stay there! After checking in, we took a scenic two-and-a-half hour long cruise down Upper Waterton Lake. 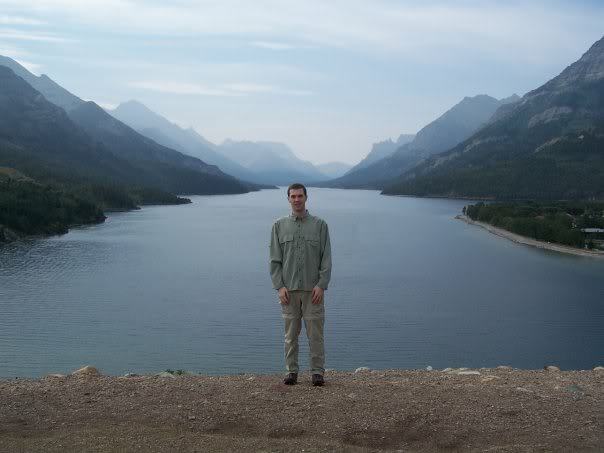 The lake is deepest in the Canadian Rockies. Our historic boat, the MV International, had both indoor and outdoor seating and offered commentary from tour guides. The landscapes were amazing as we stared at the steep and curvy mountain bowls surrounding us. We saw some beautiful waterfalls and made a few wildlife stops along the way. We saw grizzly bears, moose, sheep and eagles! We also stopped at Goat Haunt, the northern gateway to Glacier to see the visitor center there. After we returned to the Prince of Wales, we had dinner at the Lodge. What a relaxing first day in Alberta!